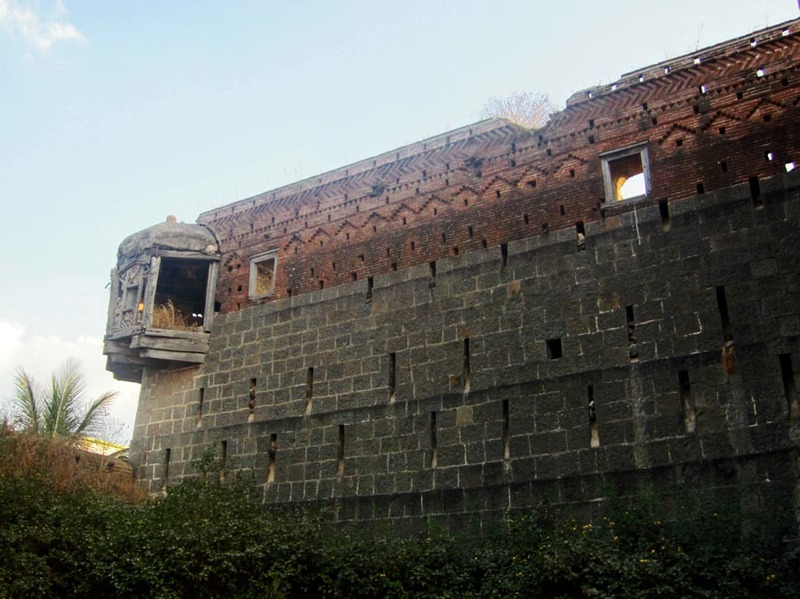 Saswad is a historical town near Pune, and besides some ancient temples, it also has the huge fortress - the Sardar Purandare Wada (large house or mansion) where the Purandare family (from my mother's side) used to live. It is a private property belonging to the Purandare family and is therefore closed to the public. 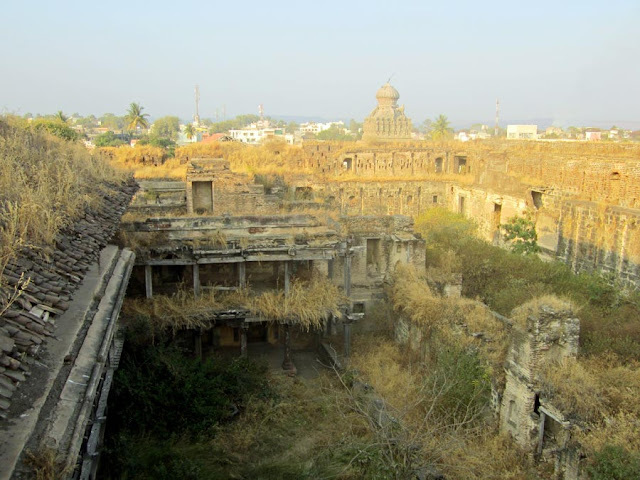 This old ancient house is more like a fort, built like one with huge stone walls and columns. 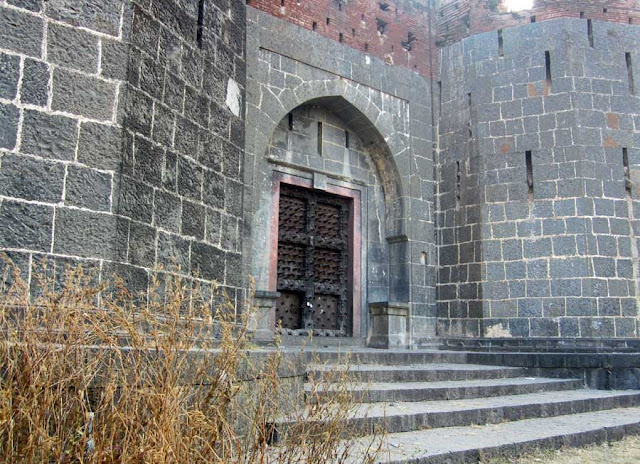 As you can see in these photos, it is a massive fortress, built to keep out invaders. Spiked doors, (at least 15 feet in height), thick stone walls which are very high, and turrets meant for guns. 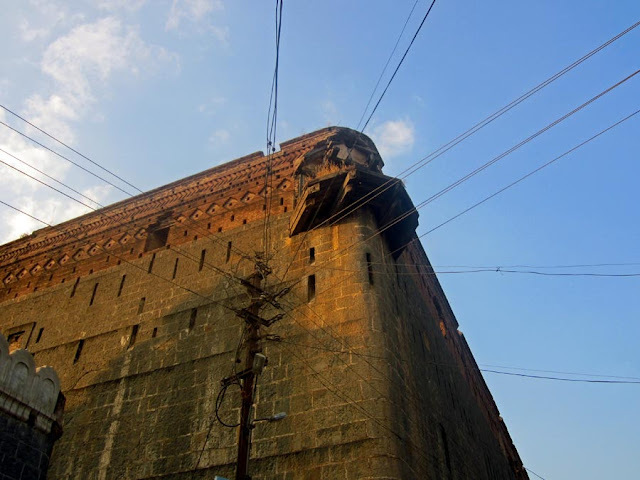 It was my ancestor, Ambaji Purandare, a deewan of the Peshwas who owned this wada and built it with the help of the Peshwas, possibly in 1710. It is today Maharashtra's oldest standing structure. A Ganesha temple is right next to it, also built by Ambaji Purandare. He built the temple on his own land, and built it before he built the wada as a gesture of goodwill, and service to the community and also for auspicious reasons. A view if you look up. Another view of the exterior of the Purandare wada. A glimpse of the inside. One side (right of the picture) has been destroyed, but the left side is standing. It is possible to climb up through narrow steps into the various rooms. The temple can be seen in the background and the town of Saswad too. Photographs of the interior rooms and carvings will be published on this website soon. Although it is in ruins inside, the beauty of it is still visible, with the wooden frescoes and carvings in the numerous rooms. You might also like to see photos of the Inside the Sardar Purandare Wada at Saswad which has some long shots of the inside, or Interiors of the Sardar Purandare Wada at Saswad which has more pictures of the rooms, stairwell and so on. Or try the labels under this post for more related images.